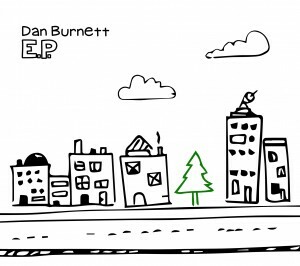 Review: Dan Burnett ~ E.P. With no tracks to waste this is an E.P. crammed with music, of varied textures, shapes and tempos with some clever guitar hooks for Dan Burnett’s voice to hang onto and stretch out. The vocals are definitely the key to the sound being produced. Dan is a singer/songwriter who brings excitement using a blues tone as the backbone shaping around this he layers stylish jazzy sound courtesy of his piano playing, funk grooves and rock beats to give the E.P. a feel of power and energy. The four tracks are self-penned each one slightly different, opening with Motown sound full of up-tempo vibes suiting the title Happiest Man Alive that gets you in the mood to listen to the whole E.P. with the guitar courtesy of Dan himself melding into the vocal phrasing. This is a mini selection that doesn’t skimp on musical depth and variety of tones. Accompanying the soulful and meaningful vocals of Dan are a plethora of musicians, the rhythm section comprises Martyn Swain on bass and drums provided by Ed Dennis or Jason Odle, guitar is stylish and accomplished from Miles Gilerdale on More Than You Deserve and then we have Frank Mizen adding horns to the mix and with Lucy adding her vocals to the backdrop we have a sound that wraps around you with its soulful funked up blues. The second track grabs your attention with its gentle piano opening and then the drums and vocals crash into the party delivering a soulful beat that encapsulates the heart of the song. The beauty that brass adds to a track is evident on More Than You Deserve, with mixed up tempos and growling guitar this is a track that just flies along hitting your musical hot spot. Ending the E.P. is a slow blues number, stripped back with Dan going solo on vocals and piano. You’re Gonna Shine what a clairvoyant would say to Dan you will shine if you keep producing music of this caliber when is the album coming out we want to hear more of what you have to offer. The recording and production are stylish giving this all too short offering shape and meaning so that the sound and lingering musical phrases in your head seem greater that the four tracks Dan offers you on E.P.